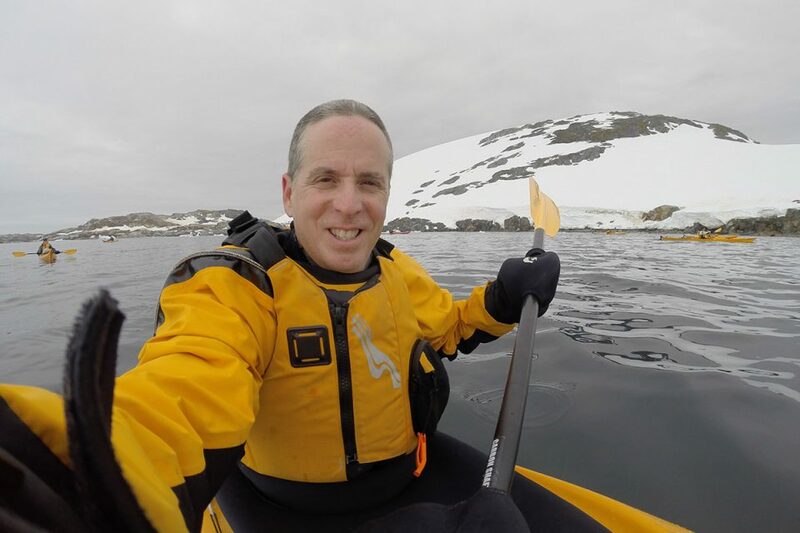 Gliding through the waters off Petermann Island, I cautiously dipped the paddle into the subzero Antarctic ocean to steer the kayak around a small flow of brash ice. Startled by my change of direction, four Adélie penguins leapt from the water and porpoised alongside me. Up ahead, the One Ocean Expeditions kayaking guide Michelle rounded the tip of the island backed by a couple of sculpted icebergs. The second guide Mark paddled off to my right. A humpback suddenly surfaced in the distance behind him, a monstrous tail lifted into the air and then slipped below the surface. I reflexively glanced down into the water suddenly remembering that YouTube video of the whale that almost swallowed a scuba diver. Nothing below. We slid through the water along the shore. An audience of curious penguins standing on the boulders stared at the strange, elongated beasts that invaded their territory. One stared so hard, it lost balance and fell into the sea next to me. Water splashed onto my bright yellow Goretex drysuit. 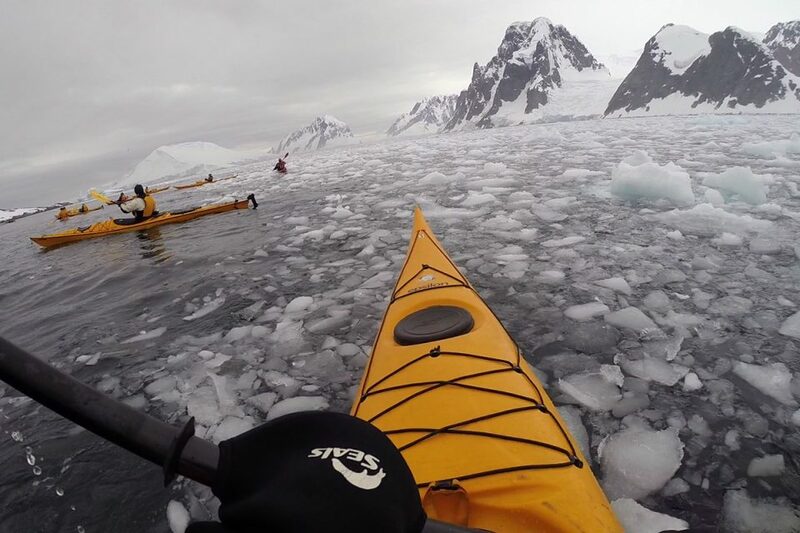 Sea kayaking in Antarctica is yet another adventurous option for One Ocean passengers who wish to get a little more up close and personal with the polar environment. 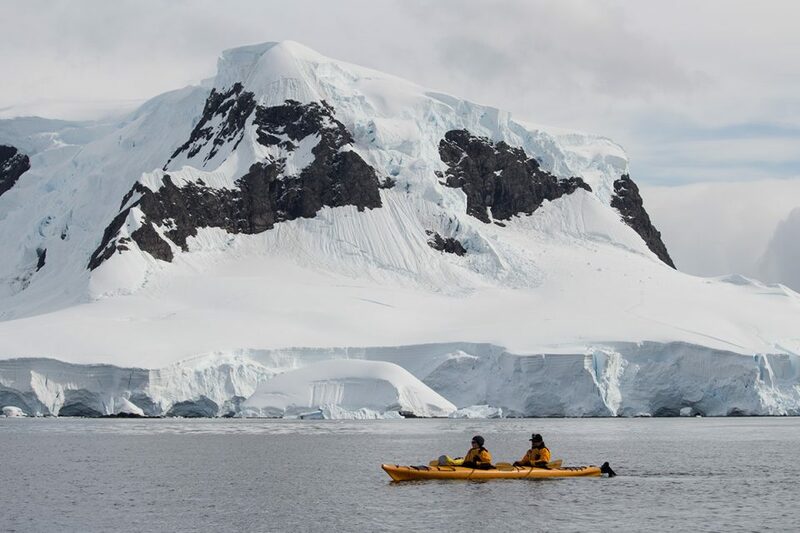 As with most Antarctica cruise operators, One Ocean only offers kayaking to a small number of people who pre-book the option and pay an additional fee. Participants are expected to have basic kayaking skills as Antarctic waters are not really the place to learn. Having said that, sea kayaking in Antarctica is not especially difficult; those with basic skills will be fine. It’s important to have a reasonable sense of balance in swells because you don’t want to end up in that icy water. And should you take a spill, you’ll need to be able to do a wet exit and get back into your kayak on your own. Unlike some other operators, One Ocean generally uses individual kayaks, so you will need to be self-sufficient when it comes to paddling. (A couple of double kayaks are also available.) You are also expected to follow directions and work as a team should anything unexpected arise. This is, after all, Antarctica and the unexpected is often floating just around the corner. As we moved further around the island, the wind started to pick up a bit increasing the swell. Since this was our first day of kayaking in Antarctica, Michelle and Mark wisely decided to turn us around and head back the way we came. We retraced our route past that curious audience of penguins. An increasing amount of ice crashed against the side of the kayak. This was my first experience paddling through ice, so at first, I instinctively tried to steer around the chunks to avoid having them hit the boat. Soon, the ice had increased to the point where that was impossible. 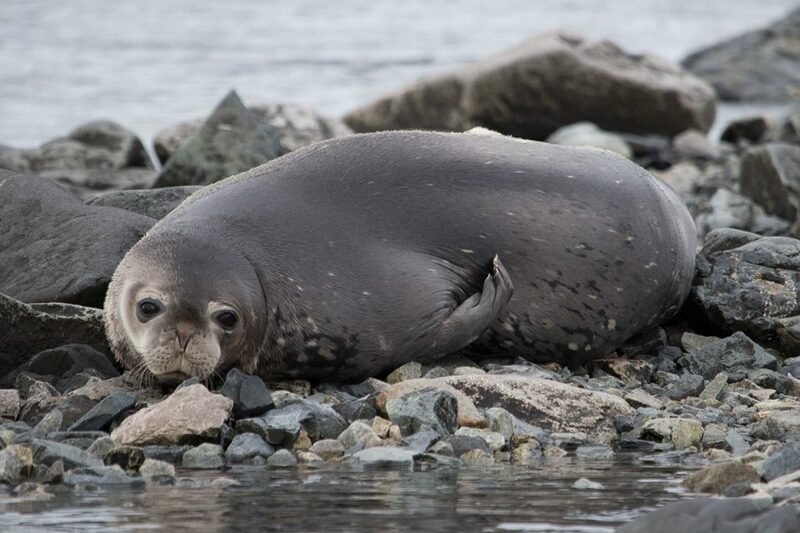 We paddled back around the island taking our time with the wildlife: Adélie and gentoo penguins, whales, skuas, leopard seals, crabeater seals… an Antarctic fantasy. But the reality wasn’t far behind. Calls came through on Mark’s and Michelle’s walkie-talkies that all passengers were being ordered back to the boat immediately. The reason for the order quickly became clear. The brash ice had moved further in, surrounding the Vavilov. It was threatening to cut passengers in zodiacs and kayaks off from the ship. Our group of kayakers pushed through the thick ice to the nearby kayaking support zodiac, and one by one we climbed into the boat. I noticed seals and penguins climbing out of the water onto small icebergs fearing that the ice would soon be so thick that they would be unable to surface for air. It was a spectacular if somewhat intimidating sight to witness the channel completely fill with ice within minutes. Unfortunately for us, we were hundreds of yards from the ship. Everyone grabbed kayaking paddles and started pushing chunks of ice – some as large as washing machines – out of the way. Slowly, chunk by chunk, we cleared a path in front of the zodiac and inched our way forward. It was a thrilling moment of camaraderie as we all worked together to reach the ship. In the distance, we could see other zodiacs which had landed on Petermann Island doing the same. For more than an hour, we fought our way against the ice pushing our way back to the boat. This kayaking excursion turned into a grand lesson on the power of Mother Nature. It was also a reminder of why kayakers needed to be self-sufficient and confident while at the same time listening very carefully to their guides. 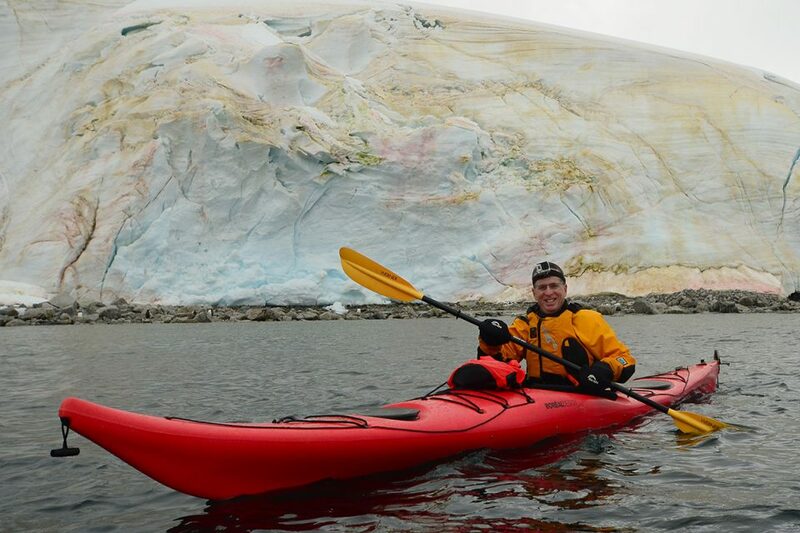 Our Petermann Island paddle was by no means a typical ‘kayaking in Antarctica’ experience. 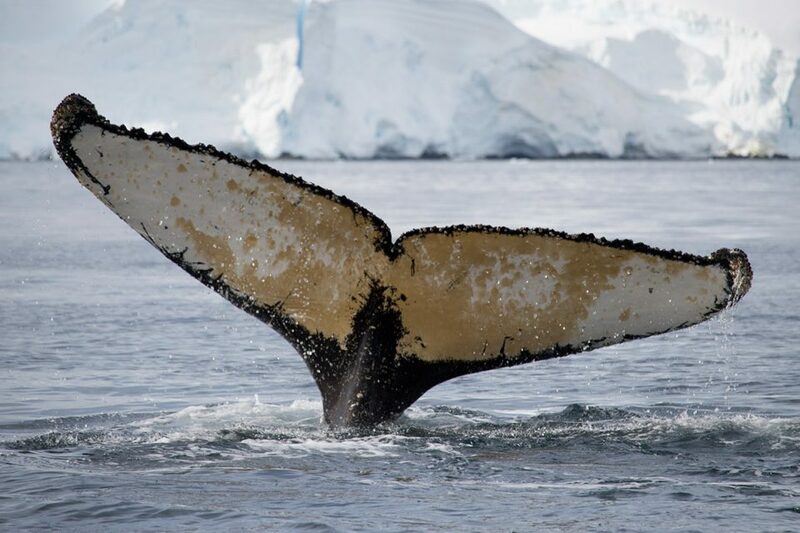 Most trips are simple excursions through glassy waters filled with icebergs, wildlife and spectacular views. But in many ways, witnessing Mother Nature flexing her muscles was one of the most thrilling and illuminating moments of our trip. Hearing the ice creak and feeling it bounce off the kayak was an unforgettable sensory experience. Slipping through the waters under the power of your own paddle, coming face to face with the wildlife was thrilling. Like the camping excursion, kayaking in Antarctica is yet another exciting way for select adventurers to experience this spectacular area. 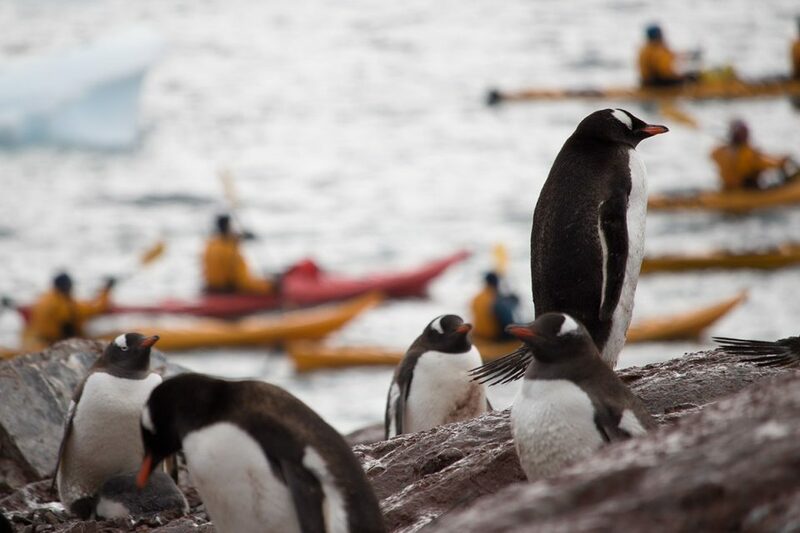 When to Go – Best time for kayaking in Antarctica is November through March. While January is great for watching newly hatched penguins, February and early March are perfect for spotting whales. Book your Trip – You must pre-book the kayaking option well in advance as spaces fill up quickly. This also means that getting a kayaking spot on a last-minute Antarctica cruise can be quite difficult, so keep that in mind as you plan your trip. The kayaking option with One Ocean Expeditions usually costs around $700 – $1,000. Alternatively, you can also check out REI’s Antarctic kayaking cruises with Quark Expeditions. Tips for Potential Kayakers – These are some important things to consider when planning your kayaking trip. If you do not have kayaking experience, consider taking a basic kayaking course before booking a kayak cruise to Antarctica. The kayaking outings parallel the normal zodiac outings. Please understand this before you book because you won’t be able to do absolutely everything. Of course, you can always opt out of a particular kayaking trip if you would prefer to do a zodiac outing or a landing. Most kayaking outings do try to land at the same sites as the zodiacs, but you will be spending more time on the water. If you have a special interest in photography, kayaking can get you closer to the subject. However, it is usually easier to photograph from a zodiac, and the height of the zodiac can often make it easier to photograph wildlife below the surface of the water. 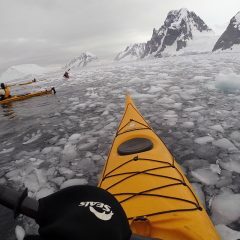 If you are visiting Antarctica with other family members, think twice before booking the kayaking option on your own. Remember that the outings parallel the zodiac outings, so that would mean you would be separated from non-kayaking family members for much of the time. Travel Insurance – This is probably THE most important thing to have. In fact, many cruise operators won’t let you set foot on the ship without overseas medical insurance. WorldNomads’ travel insurance is designed for adventurous travelers with cover for overseas medical, evacuation, baggage and a range of activities and adventure sports. You can buy and claim the insurance online, even after you’ve left home. Travel Gear – A GoPro with a head strap or another waterproof setup is useful for taking pictures. If you are going to take a DSLR, use have a very good dry bag. Make sure you bring warm, waterproof gloves as well as multiple quick-drying thermal shirts and fleeces. You’ll have a drysuit, but you’ll still get wet. Most importantly, have a couple pairs of extra thick thermal socks . You may go ashore in your drysuit, but drysuit booties aren’t as warm as the galoshes that are normally worn on shore excursions. Disclosure: We received a discounted media rate on our One Ocean Expeditions cruise. However, all of the opinions expressed here are our own. In addition, the article contains links that help us earn a small commission at no extra cost to you. Thank you for your support! Very cool. Added to my bucket list. I would really love to do this. I did not know kayaking was even an option on these trips until I read this. Wow $700-1000 for kayaking sounds like a lot of money especially since you are already paying for the cruise. @Sven, We thought the price was really high too until we really understood how it worked. The key is that you have the option of using the kayak on every outing – it’s not just one or two outings. It’s two excursions per day for each day that you are in the calmer waters off the Peninsula. So when all is said and done would you recommend the kayaking option? @Uri, I would recommend the kayaking option for people who want to spend more time on the water. Thomas and I both thought it was important to really convey that choosing the kayaking option means that you will be doing slightly different routes and will be spending less time at the landing sites. On our trip, there was only one kayaking slot available, which I signed up for. We hadn’t really processed that would mean that each time I chose to do a kayaking outing, we would be separated for most of the outing. So yes, we give a qualified kayaking recommendation. We don’t think it is the right option for every visitor – it’s the right option for people who want to experience Antarctica by kayak. I loved the kayaking, especially when a whale swam under the kayak while my dad and i were sitting there. it was very scary but an awesome experience.